Mara Hupara playground is part of the Te Auaunga/Oakley Creek stream restoration project in Mount Roskill, Auckland. Landscape architect Mark Lewis worked closely with our client, Auckland Council, and the project team to create a natural playspace that offers children a unique and imaginative experience, while also reinforcing the wider values of Te Auaunga/Oakley Creek project to restore the wairua of the adjacent Walmsley and Underwood Reserves. The project began as a stormwater control program. But it soon became apparent there was an opportunity to create a park along this regionally significant watercourse that would truly enhance the area and the community. There are several schools and early childhood centres in the area; and community surveys showed a strong desire for dedicated play areas within the reserve. During consultation in early 2015, Mana Whenua suggested to the project team that they consider integrating traditional Māori play items into the park; ideally, under the guidance of educator and author Harko Brown, an expert in traditional Māori games. 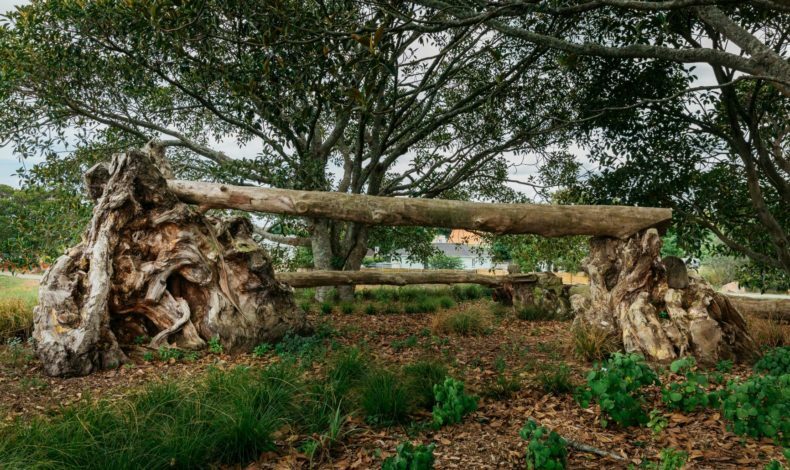 After interactive workshops with local school children, it became apparent that a ngā aro tākaro playground was an ideal fit with the restoration of Te Auaunga. A series of wera-te-paatu to practice agility, speed and balance. The 10-tonne swamp kauri used to connect the kōpapa was retrieved from another council project while the rocks used in the design were excavated from the site during the widening of the channel. The māra hūpara project was signed off by an external play specialist to ensure the safety of fall heights, accessibility and cushioned falls were compliant with standard regulations.